Neale Lunderville and Mayor Weinberger discussing BED's billing errors last year. Mayor Miro Weinberger plans to make Neale Lunderville the permanent general manager of the city's electric department. 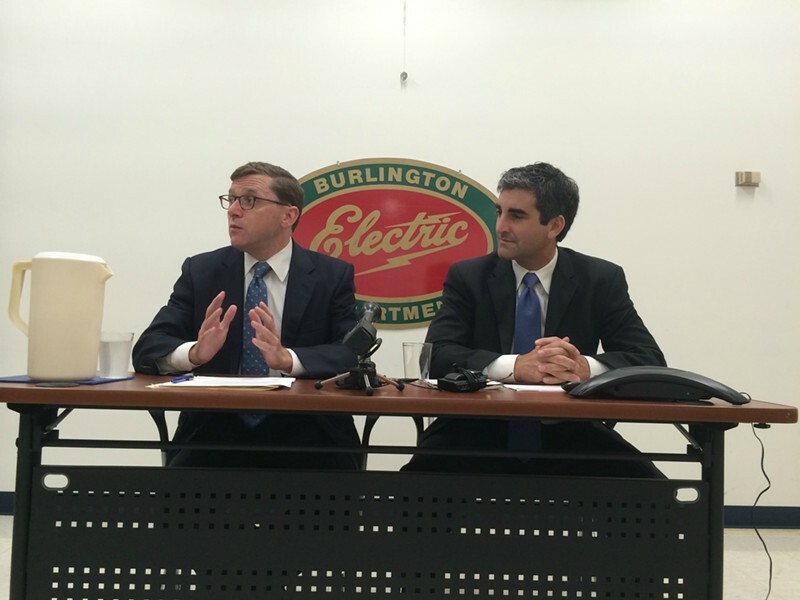 Lunderville has led the Burlington Electric Department on an interim basis since last July. After completing a search for a permanent manager, Weinberger announced his choice Thursday. The city council is expected to vote on the appointment March 23. As a former high-ranking Republican official, Lunderville was an unusual pick for the Democratic mayor, as Seven Days' Paul Heintz reported last year. Before joining BED, Lunderville was CEO of the natural gas delivery service company NG Advantage. His past jobs include serving in Governor Jim Douglas' administration, working for Green Mountain Power, leading the Vermont Republican Party and acting as Governor Peter Shumlin's Hurricane Irene recovery officer. Just weeks after Lunderville took over, the department announced it had uncovered several billing errors to the tune of $2 million. The problems predated the interim manager, and he won praise from the mayor for "responding deftly and decisively" to the situation. Several city councilors, however, took issue with the administration and BED for not fully redressing the over-billed customers, which included the city of Burlington.